The Goulburn Shire (1871-1994) in northern Victoria was proclaimed on 24 March 1871. It had an area of 850 sq km, and its administrative centre was Nagambie. Other places in the shire included Graytown, Longwood, Murchison East, Ruffy and Tabilk. The shire was named after the Goulburn River, which was found in 1824 by the explorers Hume and Hovell. At first named Hovell River, it was renamed Goulburn either after Henry Goulburn, British Under Secretary for Colonies (1812-21) or after his brother Frederick, Colonial Secretary of New South Wales (1820-24). The Goulburn River flows from south to north approximately through the middle of the former shire. At Nagambie there is Lake Nagambie and downstream the Goulburn Weir (1890), supplying irrigation waters to the Murchison district. Lake Nagambie is a leading rowing venue. From having about a quarter of the shire’s population in 1890, Nagambie had nearly half in 1990. 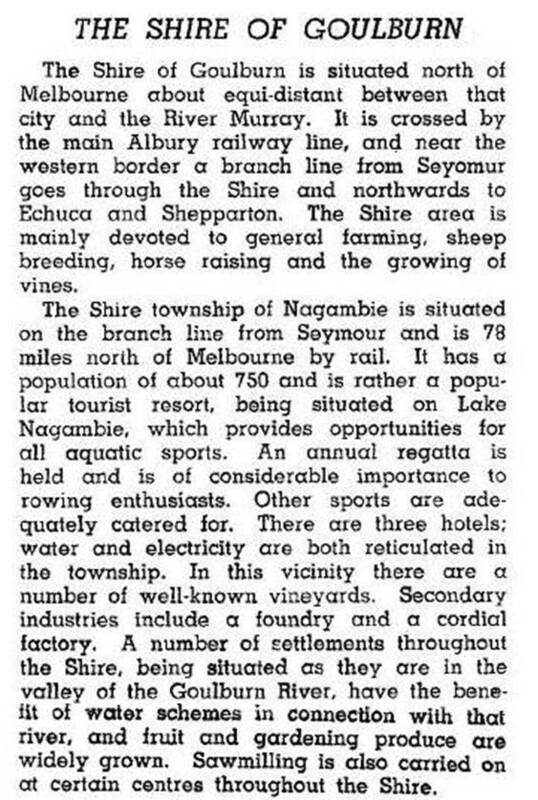 Nagambie is on the highway and the railway from Melbourne to Shepparton. Goulburn shire’s main rural industries included sheep grazing, general farming and some viticulture and orcharding. Earlier industries included saw milling and dairying. In 1956 the shire was enlarged by the inclusion of the Graytown district from McIvor shire. Goulburn shire’s area was 1016 sq km and in 1994 it had 156,000 sheep and lambs and 13,800 cattle for meat. Cereal crops were grown on 4880 ha of farmland, wheat taking 60% of the crop area. On 18 November 1994, most of Goulburn shire was united with most of Euroa and Violet Town shires and parts of McIvor shire and Shepparton rural city to form Strathbogie shire.